Hello i setup a local server in order to the desciption for setup an local Blynk Server (servername and mail are modify for this post). 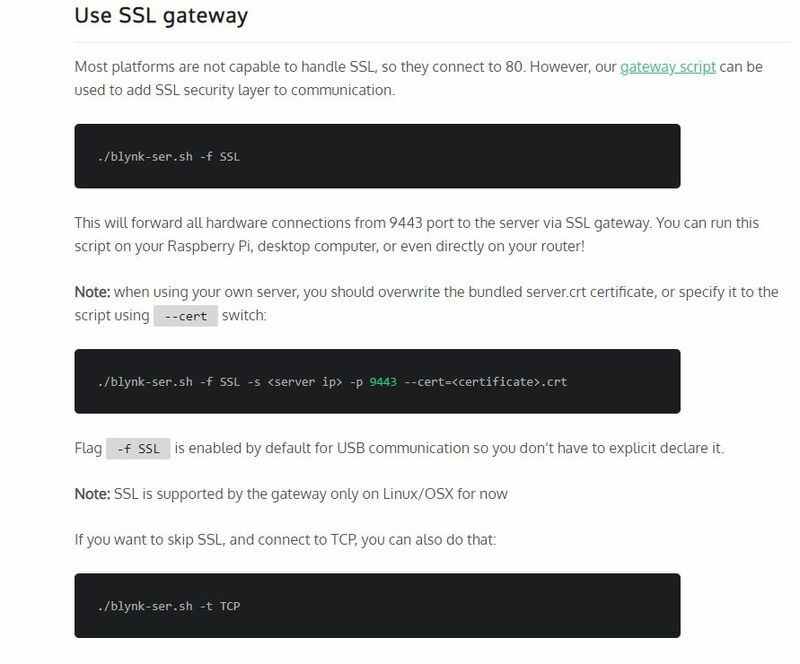 >    certificates, run "letsencrypt-auto renew"
> Using native epoll transport. > 15:29:09.083 INFO - Didn't find Let's Encrypt certificates. > 15:29:09.083 WARN - You didn't specified 'server.host' or 'contact.email' properties in server.properties file. Automatic certificate generation is turned off. Please specify above properties for automatic certificates retrieval. > > 15:29:10.383 INFO - HTTP API and WebSockets server listening at 8080 port. > > 15:29:10.385 INFO - HTTPS API, WebSockets and Admin page server listening at 9443 port. > > 15:29:10.388 INFO - Mqtt hardware server listening at 8440 port. > > 15:29:17.468 INFO - guido..@..de Blynk-app (android-22701) joined. > sudo /etc/init.d/blynkstart.sh start ..
additional i try it with index.js example but here the same result, when i connect the cloud it works, when i try connect my local blynk server i get te same message. i stil have no idea why this issue comes up. Even the certification is installed and setup in the server setup. I hope someone has an idea, what i did wrong. After some more tests i found out that it must to do with the client side “server.crt”. I think i have to fill in here the certificate from the Blynk server. But I am not sure what i have to copy from where. I think it must be the letsencrypt file from the domaine myserver.de . But where i can find this? What exactly should be the name? I find in the letsencrypt directory some .pem links. I try all content and exchange the server.crt file content with all 4 link results from my letsencrypt directory of my domain. 15:29:09.083 WARN - You didn't specified 'server.host' or 'contact.email' properties in server.properties file. Automatic certificate generation is turned off. Please specify above properties for automatic certificates retrieval. What happens if you specify server.host? 10:06:55.794 INFO - Region : local. Host : blynk******.de. 10:06:55.859 INFO - Using native epoll transport. 10:06:56.896 INFO - Didn’t find Let’s Encrypt certificates. 10:06:56.897 INFO - Automatic certificate generation is turned ON. 10:06:56.897 INFO - Using native openSSL provider. 10:06:58.379 INFO - HTTP API and WebSockets server listening at 8080 port. 10:06:58.382 INFO - HTTPS API, WebSockets and Admin page server listening at 9443 port. 10:06:58.392 INFO - Mqtt hardware server listening at 8440 port. seems no help for this issue? Here is the directory of my keys. Hopefully this might give you some tips? Note that i have these two lines… some would say these are the most important to the server.properties file. It not helps, but thanks for your configurations. I will setup a local server in my Lan, inside I don’t need ssl.